The Islamic Cultural Center of Quebec was attacked by gunmen this evening, killing at least 5 people and wounding countless others. There were approximately 40 people in the center at the time. The three gunmen were armed with automatic weapons. Mohammed Yangui, the Quebec City mosque president, tells me the morgue has informed him five dead in their custody. Not confirmed by police. According to The Daily Mail, local media have reported that two people were taken into custody related to the shooting: Alexandre Bissonnette, 27, and another man, Mohamed Khadir. The latter was a witness and NOT a suspect. 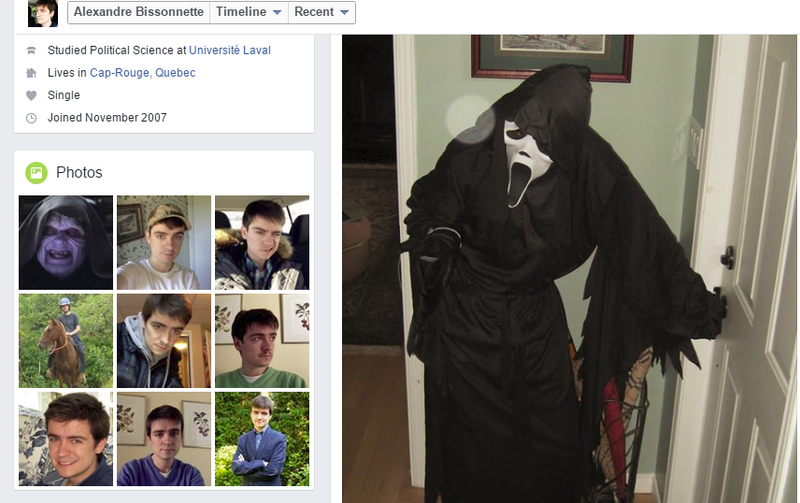 Here is Alexandre Bissonnette's Facebook, according to Heavy. The Facebook account has numerous pictures of him. The account shows a man playing video games, and generally having fun. There is very little religious or provocative information posted by Bissonnette. Bissonnette's music tastes included Weezer and Katy Perry, as well as German band Rammstein. Some of the books he liked were on chess theory. He also like the Feminist Movement of Laval University. He also liked Donald Trump on Facebook. He also liked Christian site Reasonable Faith, which describes itself as "an intelligent, articulate, and uncompromising Christian perspective on important issues concerning the Christian faith today." Were either of the gunmen Muslim? Why did they do this? "It seemed to me that they had a Quebecois accent. They started to fire, and they they shot they yelled, 'Allahu akbar!' The bullets hit people that were praying. People who were praying lost their lives. A bullet passed right over my head," said the witness. "There were even kids. There was even a three-year-old who was with his father." CBC is a reputable institution, but there is no corroborating evidence to support this claim. Logically, this seems extremely unlikely too -- why would an Islamic terrorist with access to high powered weapons in Canada use those weapons on a random Mosque instead of trying to attack targets suggested by ISIS? There have been several incorrect reports related to this. The Daily Beast has named two people who are not related to the shooting. Another apparent hoax going around Twitter and Reddit names two people who were claimed to have shown up on a police scanner. These "police scanner" reports very often turn out to be completely wrong. It's unlikely that people with these names even exist. How did the shooters get in? According to L'Soleil, the police have not divulged how the gunmen entered the mosque. The Islamic Cultural Center consists of a Mosque and teaching facility. It had been the target of vandalism and violence in the past, including one recent incident in which a pig's head was placed in the entrance, according to The Globe and Mail. The incident occurred during Ramadan. Police in the area closed a lot of the bridges and other access points. The online blame spread immediately, with the left blaming U.S. president Donald Trump, and the right blaming Muslims, saying that this shows the need for a Muslim ban. Still others blamed Prime Minister Trudeau. Wanna read more on this? Check these out: Is Kevin Dale Martin The Rancho Tehama Shooter? (more); Who is the Orlando shooter? Is it terrorism? (more); GOP Greg Gianforte Gets Record Donations After Assaulting Reporter Before Election (more); Donald Trump Pal Anthony Scaramucci: 'I Don't Need To Defend [Trump] On The Merits' (Watch) (more). And here are some more related articles: Watch Jordan Peele's Hilarious 'Get Out' Spoof Starring Ivanka Trump (more); Did Donald Trump Just Block U.S. Citizen Khizr Khan From Traveling? (more); Trump Close Pal Roger Stone Tells Woman to 'Eat S--t', Calls Her 'Ugly B--' (more). A few more: 'Camp Of The Saints': Read Actual Quotes from Steve Bannon's Bible (more); Watch Trump Pal Carter Page Act Super Sketchy on 'All In with Chris Hayes' (more).